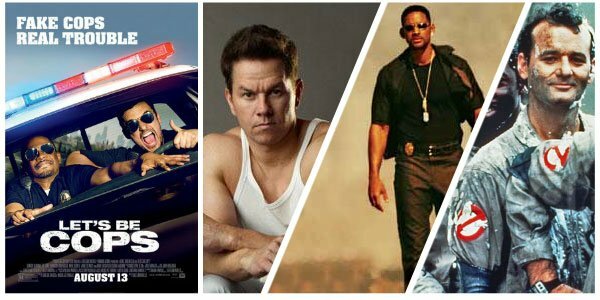 Looking to The Expendables 3, Let's Be Cops and Step Up All In for inspiration, we've pulled together a selection of classic Expendable cinema, kooky action comedies, and dazzling dance movies. In this fifth installment of the popular dance movie franchise, some of your favorite Step Up alum (no, not Channing Tatum) reunite for a dance-off in Las Vegas. Ryan Guzman, Briana Evigan, Adam G. Sevani, and Misha Gabriel Hamilton co-star; Trish Sie directs. 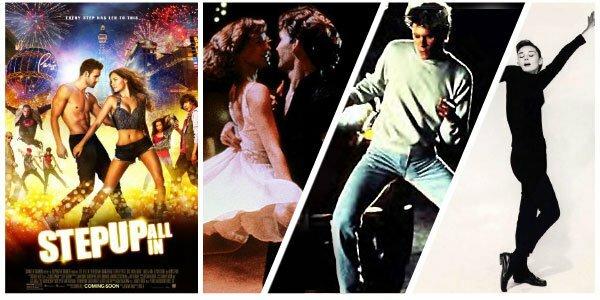 For more movies that will inspire you to get up and two-step, try this trio that boasts iconic dance numbers, a legendary hoofer, and an actor so omnipresent he's inspired his own party game. Dirty Dancing (1987) When she and her family vacation in a Catskills resort, 17-year-old Frances "Baby" Houseman (Jennifer Grey) discovers first love with the camp's hip-swiveling dance instructor (Patrick Swayze). This beloved and steamy romance is the perfect pick to heat up you summer. Jerry Orbach and Cynthia Rhodes co-star; Emile Ardolino directs. Funny Face (1957) Audrey Hepburn stars as a beautiful beatnik book-lover whose set to become the next big thing in the modeling world. The one and only Fred Astaire co-stars as a photographer who first falls for her funny face. Stanley Donen directs. Footloose (1984) In the movie that made Kevin Bacon a household name, he stars as Ren McCormick, a city kid with a dance in his heart, forced to move to a small town where dancing is outlawed. Of course, he'll cut footloose and change everything! Herbert Ross directs. Sylvester Stallone brings his biggest ensemble of action heroes together for an adventure that pits The Expendables against a mental arms dealer played by Mel Gibson. Jason Statham, Jet Li, Antonio Banderas and Arnold Schwarzenegger co-star; Patrick Hughes directs. Read our review here. 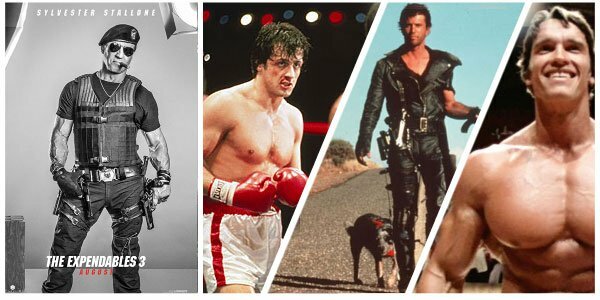 Before they were Expendables, Stallone, Schwarzenegger and Mel Gibson were muscle men with big dreams. See each in a standout moment from their early days with these three films that still hold their own. Rocky (1976) Based on the true story of boxer Rocky Balboa, this biopic written by and starring Sylvester Stallone made him a big star and earned him Oscar nominations for Best Original Screenplay and Best Lead Actor. Here he stars as a an uneducated amateur boxer whose abruptly given the spotlight when he's invited to fight world heavyweight boxing champ Apollo Creed. Talia Shire, Carl Weathers, and Burgess Meredith co-star; John G. Avildsen directs. Mad Max (1979) This wildly popular Australian actioner launched Mel Gibson. In it he plays Max Rockatansky, a jaded cop turned seeker of vengeance after a merciless biker gang murders his family. In the postapocalyptic future, Mad Max is a dangerous man to be reckoned with. Hugh Keays-Byrne, Joanne Samuel, and Steve Bisley, co-star; George Miller directs. Pumping Iron (1977) Before he was a movie star, Arnold Schwarzenegger was an egotistical body builder. (Shocker, right?) This still compelling doc takes audiences behind the scenes of the 1975 IFBB Mr. Universe and Mr. Olympia competitions. As five-time Mr. Olympia winner, Schwarzenegger is the favorite, but a young--though nervous-- Lou Ferrigno could give this Austrian egomaniac a run for his money. Robert Fiore and George Butler direct. Two goof-ball besties decide to bring some excitement--and trouble--into their lives by masquerading as cops. But when their ruse tricks some real mobsters, they'll need to become actual heroes to survive. Jake Johnson, Damon Wayans Jr. star; Luke Greenfield directs. Read our review here. For more action-comedies that will get your blood pumping and your eyes tearing with laughter, make a marathon of these titles. Pain & Gain (2013) Based on a true story that's stranger than fiction, this Michael Bay-helmed dark comedy stars Mark Wahlberg as a bodybuilder with ambitions of great wealth. But why work for it when you can steal it? Teaming with two dunderheaded but burly colleagues (Anthony Mackie and Dwayne Johnson), he kidnaps a millionaire, starting a chain of events that will bring in a relentless lawman (Ed Harris). Rebel Wilson and Rob Corddry co-star. Bad Boys (1995) This high-speed actioner marks Michael Bay's feature directorial debut. Comedians Will Smith and Martin Lawrence star as two Miami narcotics cops who are chasing down Miami narcotics cops. Téa Leoni co-stars. Ghostbusters (1984) They ain't afraid of no ghosts! A motley crew of paranormal investigators and scientists are New York's only hope when a deadly demon begins stirring up trouble in a cellist's apartment. Bill Murray, Dan Aykroyd, Rick Moranis, Sigourney Weaver, Harold Ramis, and Ernie Hudson star; Ivan Reitman directs. Ghostbusters 2 is also streaming.